There are numerous magazine articles and books written on the topic of getting over breakups and heartaches. There are just as many resources containing information suggesting when a person should seriously consider ending a relationship. However there are very few instances where one is given advice on: How to breakup. It is presumed that being dumped is hard and dumping someone is easy. Anyone who has ever initiated a breakup, divorce, or fired someone is keenly aware of the stress that builds up days and nights before an announcement is made. Countless times one goes over the various possible scenarios in their mind in an attempt to be prepared for whatever reaction their soon to be ex will display. The following is a simple strategy for parting ways. The first thing you need to do is some serious introspective thinking as well as reflecting on the relationship in order to determine if you genuinely are ready to call it quits for good. 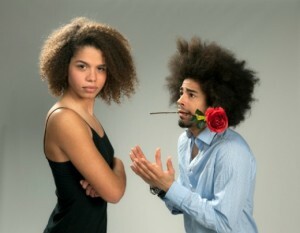 Breaking up should be thought of as being just as serious as taking wedding vows. You don’t want to create a yo-yo relationship where you breakup one day and call to makeup the next day. One of the best methods for making a tough decision was originated by Ben Franklin. Take a sheet of paper and draw a line down the center. On the right side of the paper use the heading (pros) and on the left side of the paper use the heading (cons). Begin to list the pros and cons for staying in the relationship. On another sheet of paper you might do the same thing for traits you desire in a mate versus traits your significant other possesses. The goal is to get everything in black and white. This will also help determine the reasons why you want to end the relationship. Be honest with yourself. After you have thought things through and have decided that it would be best for you to breakup the next step is to plan your exit. Once again there are countless opinions about what is the right or wrong method to use. However there are two things you should keep in mind. Breakups are done at the comfort level of the person ending the relationship. You must also take into account the individual’s temperament and the type of relationship you have had as well as it’s length. If you have personally witnessed this person put their fist through a wall, throw furniture, or yell like a maniac when things did not go their way; it’s probably not a good idea to breakup in person. Do not worry about your ex branding you as a coward. Your safety comes first and what your (ex) thinks of you should not concern you! You don’t want to end up a like Travis Anderson stabbed 27 times and shot in the head while taking a shower. Under ordinary circumstances you want to breakup in person if possible. If you live apart gradually remove any items you have at their place prior to the day you have “the talk”. On the actual day you plan to breakup with them make sure you have brought everything of theirs with you. Ideally you want to breakup at their place. This allows you to exit after you have said what needs to be said as oppose to trying to find a way to get them to leave your place. It is also safer for them to not have to drive right after you deliver news that is likely to upset them. If you live together find you another place of your own or make arrangements in advance to have a place to go to after the conversation. Having to remain under the same roof after a breakup is living life on a high tension wire without a net. If your name is on a lease you might schedule the breakup prior to the deadline for renewing a new lease. Should you feel uncertain about your ability to quietly stay in the relationship until the lease expires before breaking up review the consequences for breaking the lease. The cost of freedom is never too high. In the event you are married it is advisable to meet with a divorce attorney or paralegal to get guidance. Since you are the one ending the relationship there should be no reason why you aren’t prepared. Anticipate how your future ex will respond to the news and be ready. Don’t get sucked into a “blame game” or heated argument. The goal of your soon to be ex is to get you to list “reasons” which they’ll try to convince you they can change or address. If you have sincerely made up your mind the relationship is over then it’s cruel to allow them to beg, plead, or lose their dignity. Expect to be accused of never caring about them or of cheating. No one wants to believe they were dumped for being themselves. Something underhanded must have taken place in their eyes. Stay calm! Remember it is not necessary to have a long drama filled nightmare in order to “justify” a breakup. If you are unhappy or just want to date other people that is all the reason you need. If the conversation starts going sideways make your exit while informing them you do not wish to be in contact for a while. Do not offer “instant friendship” as a consolation prize! Too often people offer friendship in an attempt to avoid being looked at as “the bad guy”. However this tactic simply raises false hope for your ex that if they remain in your life there is a “chance” they can win you back overtime. You are the last person who can help someone get over you! Remove yourself from their world as much as possible. Unfriend them on your Facebook account, avoid places you know they frequent, refuse to respond to emails, texts, or calls. If you are sent gifts or cards don’t acknowledge them. The purpose of sending you things is to get you to initiate contact or pull you back in. It is best to go “cold turkey” for six months to a year. The best friendships between exes usually occur when there has been a major gap in time and both people have become involved with others. In the meantime turn the page and spend time with friends and family.